"A Skate-Rock Adventure of the Deadly Kind"
A wise man once said, “you can’t intentionally make a cult film”. A director can’t wake up and say “I’m going to start to make a cult film today”. That’s not up to him to decide. Sadly, director/writer/star Robert McGinley had to learn this lesson the hard way with Shredder Orpheus. A modern-day (futuristic?) 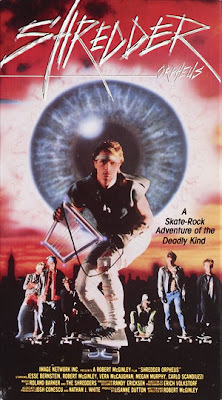 retelling of the Orpheus legend, but with “rock” music and skateboarding, it seems McGinley was going for a Street Trash (1987) meets Liquid Sky (1982) meets Brazil (1985) meets Repo Man (1984) meets Jean Cocteau’s Orpheus (1950) sort of thing. Apparently, in the future, bums and vagrants live in a trailer park-like section of town (Seattle or places near Seattle from what we can gather) called “The Gray Zone”. The most radical dude in the Gray Zone is, naturally, Orpheus (McGinley). He is the singer/guitarist for the hottest band in town, The Shredders. When his girlfriend Eurydice (Murphy) unexpectedly dies, Orpheus, with his lyre in hand (actually a futuristic “guitar” that doesn’t look or sound anything like a guitar, said to be designed by Jimi Hendrix before he died, which is just insulting. There’s no need to drag Hendrix into this), makes his descent into the underworld, represented by the EBN, or “Euthanasia Broadcast Network”. Here, hell is a TV station that brainwashes the populace. Will this “Shredder Orpheus” be victorious? You might think that what we just described might be good. Maybe on paper it is, but the headache-inducing colors and music are eye-sores and ear-sores. There are no likable characters and the whole thing has this smirky, annoying vibe of “we’re trying to be funny and smart” which falls completely flat. It feels like a student film made specifically for public access TV. It’s grungy, and the only reason we watched it is because it was released by AIP. Troma must have passed. The movie is nonsensical and grating. It really tests the patience of viewers. It’s not enjoyable to watch, it’s more like a battle to get through. Maybe that’s why AIP picked it up, it reminded them of their war films. One of the main detriments is that there is no main star you can get behind. There’s no Robert Z’Dar, no William Smith, no JAY ROBERTS JUNIOR for crying out loud. Without a powerful main star presence, the film is anchorless and aimless. Teachers can’t even show it to their students if they were learning about Greek myth. Shredder Orpheus is for AIP completists only. Wow, 0-for-2. Still, we always have Deadly Prey to look forward to. We are excited to post Deadly Prey soon. Shredder Orpheus is one of the worst AIP movies we've seen. All the other AIP flicks are masterpieces compared to this one! Thanks for supporting AIP-April DTVC! It was just a pick up by AIP, it wasn't made by them. If David A. Prior directed this, it would be a decent movie.